Buzzy, Congratulating Himself on a Job Well-done! When I get lazy about making my bed in the morning, Buzzy comes to get me. Making the bed is the high-point of the morning, involving considerable growling and tossing of his “babies” off the bed to let me finish the job. That being done, he encourages me to cook breakfast and load the dishwasher, ever hopeful that he’ll end up with a tasty tidbit. He’s a pretty good little housekeeping coach! One of the best things about our little dog Buzzy is that he loves everything we do, just as long as he can be in the middle of it. At home or camping, he makes every step we make, doesn’t miss a sight, When we are packing our trailer, he makes every trip, just to make sure we don’t slip off without him. He is so relieved when he sees up pack his food, snacks, Precious Baby, and leash, but doesn’t totally relax until he gets his leash on and gets to hop in the back seat of the truck. In the picture above, you can see him settling in the first at night at camp with his Precious. When he gets tired, he bites down on its nose to relax, just like a baby with a pacifier. 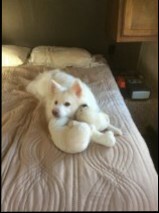 This particular baby has been handed down to him through two previous owners, both American Eskimo dogs, just like him. I assure you, he’d never have been allowed possession of it if either of them were still around.